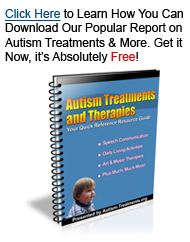 There are various sides to treating autism and they are all important. The two most important are working with physicians and other medical professionals and educational professionals to treat autism on a continuous basis. The other of the two is treating and working with autism at home. If you have a child with autism, it is important that you learn all you can about autism in general and about your child’s specific symptoms and situation so that you can care for them in the most effective and efficient way possible. It is also important that you learn what you need to be able to take care of yourself, so that you can do a good job of taking care of your child. Taking care of yourself includes determining how much sleep and rest you need and trying to get as close to that as possible, eating healthy foods daily and making sure you are getting enough vitamins, minerals and protein regularly and trying to create some personal time during which you can read, exercise, visit with friends, go out for a cup of coffee or a meal or something else that you enjoy and that will take you away from being a caregiver, even if only for an hour. There are respite services available, or you may be able to ask a close friend or family member to cover for you for a short time. The better condition you are in, the better you will be able to care for your child. In most cases reducing family stress helps a child dealing with autism function better. When dealing with your child’s autism, find out about their educational rights. According to the federal government, all children have the right to an education including those with disabilities under which autism is included. In addition to federal rights, there are often state and local types of assistance for children with autism, and this assistance can include various forms of treatment, education and other benefits. Treating your child’s autism at home goes hand in hand with any other treatment they are receiving. The more you learn about treatment and assistance for them as well as taking care of yourself, the more successful you – and they – will be.